AirTamer / Air Tamer Personal Air Purifier / Springs Heralds the Arrival of Pollen Allergies! Are you Prepared? Springs Heralds the Arrival of Pollen Allergies! Are you Prepared? The flu is slowly receding but with the arrival of Spring, it is time for pollen and seasonal allergies. A proven way to keep yourself protected from pollen allergies is to use a high performance personal air purifier, the AirTamer A310. 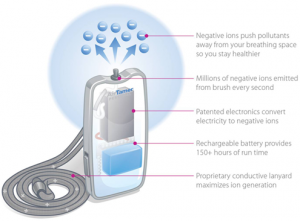 This high performance personal rechargeable air purifier emits a constant stream of healthy negative ions that push pollen, viruses, smoke, molds and dust mites away from your breathing space. Use the AirTamer A310 air purifier, the handy portable device that purifies the air in your house and improves the quality of the air you and your family breathe in.